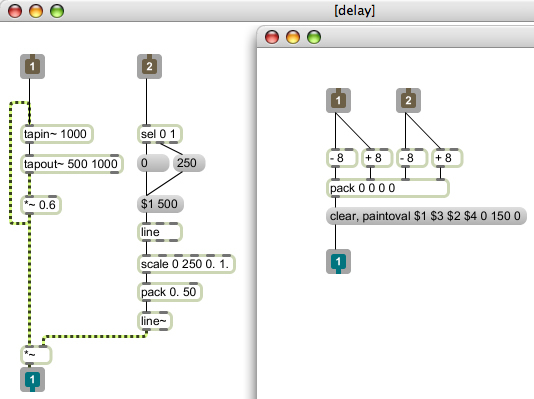 The most surprising thing about learning to use Max/MSP is that the more I practice, the better I get. You may think that's a stupid, sarcastic comment but, as I slowly progress through the tutorials and mess around with my own patches, I find myself genuinely astounded at how quickly everything falls into place. Sure, there are problems here and there and solving them often involves a fair amount of brain power, but you get a real sense of progress from doing so. 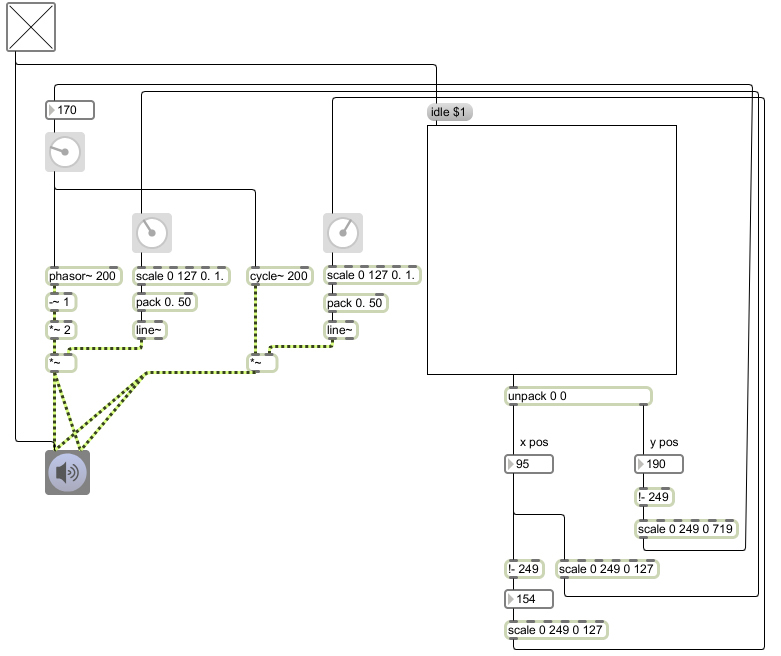 Over the last few days, I've been improving the patch I made for my previous blog - a very basic, dual-oscillator synth controlled by an X/Y pad for the mouse. The patch was lovingly dubbed (somewhat inaccurately, seeing as it's nothing like a Theremin) Rubbish Theremin. As you might be able to guess from the name, it had a few problems. You may remember I had a problem with the two oscillators (one sine wave and one sawtooth wave) and phase cancellation. 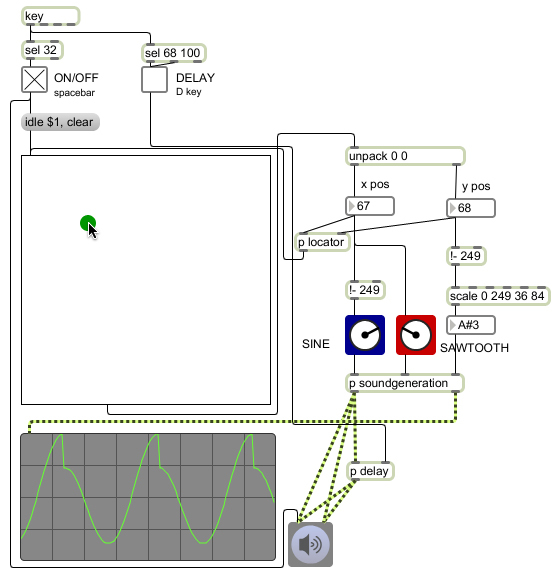 So, borrowing from a helpful chap called Chris Muir (from the Cycling '74 forums), I changed signal path of the sine wave generator so it would act as a slave to the sawtooth generator. This ensured the phase of the two devices would always be in sync. I also borrowed further from Mr Muir, who suggested converting mouse movements to a MIDI note value, in order to keep pitches in tune. Aside from generally tidying things up and removing unnecessary objects, there are quite a few changes to version two of the synth. The most obvious change is the addition of subpatches. Subpatches, as you might guess, are smaller patches within a larger patch. 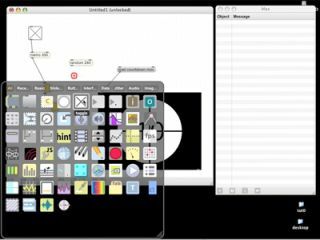 If you have a whole group of objects doing just one task, for example, you can group them all together and 'encapsulate' them. This means that instead of an unsightly array of objects and patch cables, you just have one neat box that looks exactly like any other Max object. Should you need to make changes, double-clicking the subpatch object will bring up its contents in a new window. The image above is a subpatch from the new Theremin patch. It handles the sound generation of the patch: pitch comes in at the 'inlet' on the right, and the other two inlets receive information from faders which in turn control the crossfade between the two oscillators. Sound is then sent to the outlets (one at full volume for the oscilloscope and one quieter for speakers (and human ears). All-in-all, there are 16 pieces to the puzzle. From the outside, however, there is just one: the subpatch object (below). It makes such a difference. Once I'd built this subpatch, I could essentially forget about the sound generation part of the synth and concentrate on the bigger picture. The final improvement was to allow sound on/off and delay on/off to be controlled by the computer keyboard. Disappointingly, for all my tweaks and tidying, the patch still looked pretty awful. So delving back into the tutorials, I discovered the world of presentation mode. …and the recently-dumped old patch is consoled by its friends. "There there, the new patch isn't that good-looking. It's all just hair and makeup…"